Yesterday we woke up to this gorgeous view of Phi Phi Don Bay; what a sight to see. The above is a panoramic, so click through to see the full pic. After breakfast in the hotel and lounging around in the pool, we found out that the bank needs your passport to exchange currency. That gave me (Brad) a chance to walk around the town a bit more before we rallied at the hotel to join a tour of Monkey Beach, Maya Bay and the sunset on the open water. But, before we left, we were joined by some monkeys of our own, right in front of our hotel. Directly above us, two rock climbers were making the multiple-hour ascent. Hope they made it! A quick taxi boat took us to a solid 40′ two level touring cruiser, equipped with kayaks, to join the other 20 or so guests. Lesley and I had a chance to snap a few pics before I got too sun burnt. 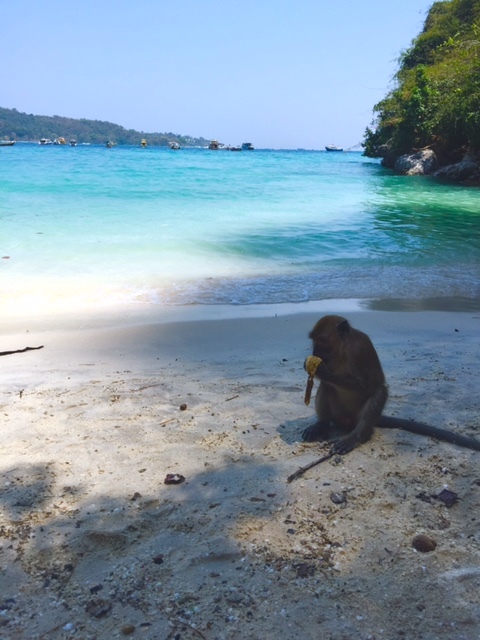 On the way around the east side of Phi Phi Lee island, we stopped at the south western part of Phi Phi Don at a lace where the monkeys rule. LL and I snagged a kayak and zipped over where I handed a monkey a piece of pineapple. Fascinating little guys! 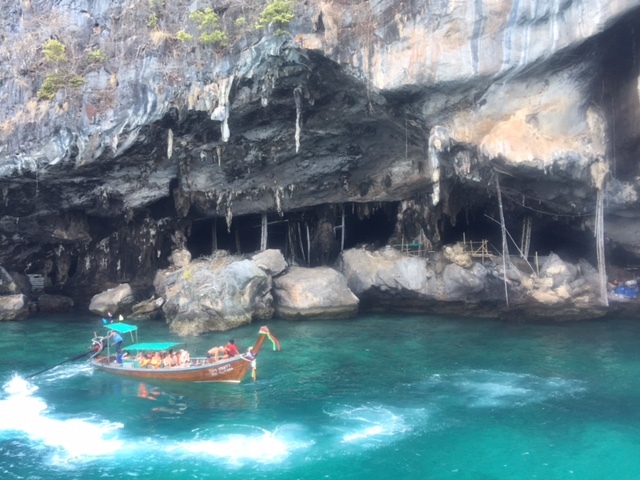 Then, after crossing the pass to Phi Phi Lee, we saw a set of caves where royalty used to snag the birds nests for soup. It’s still a delicacy today, although LL and I haven’t tried it yet. Next up, lots of pics of Maya Bay, the other side of the island and the beautiful sunset.